Opening Ceremonies: President Scott Kimball called the meeting to order. Invocation by Larry Fernald and we said the Pledge of Allegiance. Door Prizes: Cholates to Tony Bouchard, Rod Fox and Allegra Pellerano. Olive Oil/Vinegar to Teri Stephens, Tea to Fred Beyer. Happy Dollars Highlights: Debbie Ehrlenbach, Micki Sumpter, Carl Lusby, Ashley Johnson, Jo Cooper, Gene Pellerano, Marc Rich, Tracy Shaffer, Larry Johnston, Dave Wells, Marian Wells, Rod Fox, Jane Langley, Fred Beyer, Peter Farragher, Marshall Smith, Teri Stephens and Scott Kimball. All Happy Dollars are going towards the District 2019 Wheel Chair project this quarter. 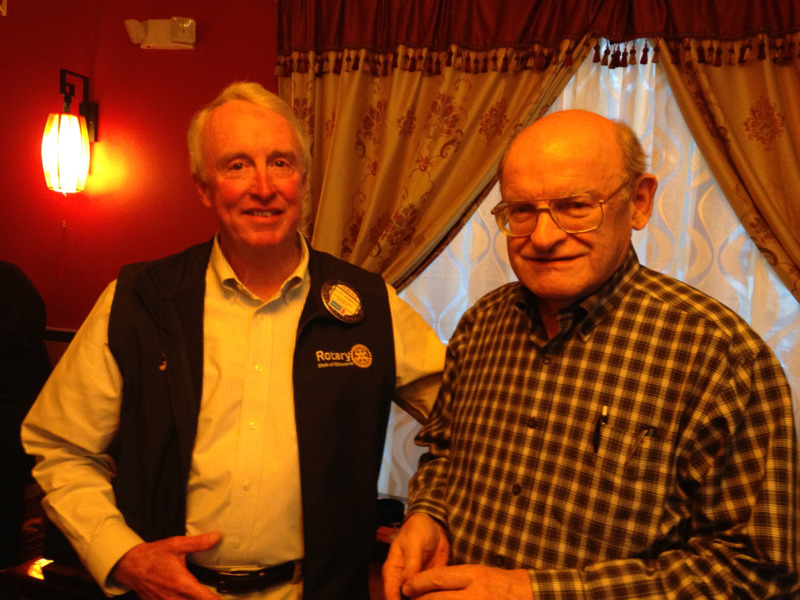 Congratulations to Ray Williams for receiving his Paul Harris +1 Pin! 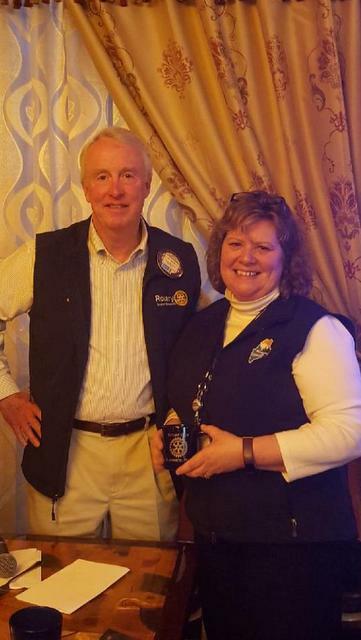 Jane Langley received her Rotary Vest for completing the passport program! Congrats Jane! Auction Update: Tracy reminding club members to bring in their Auction Items to the YMCA or at our weekly Rotary meetings or at Becky Sargent’s Office. The next Auction committee meeting is April 17th at the MCMH Board Room at 1:00pm. EHS Honors Banquet: Next week (April 10th) at China Hill starting at 5:30pm. Students will be arriving at 5:15pm. The Student list will be emailed out again this week. Ben Speed is our guest speaker. Rotary Foundation: Every Rotarian Every Year (EREY) Drawing Prize Winner this quarter went to Ray Williams. He received a gift card. Reminder: The Bar Harbor (MDI) club is celebrating their 50th Anniversary on Saturday, April 28th, 2018 from 5:00pm to 9:00pm at Kebo in Bar Harbor. They would like to invite members of the Ellsworth clubs to join them. Cocktails with cash bar and appetizers, 5 to 6, music, buffet dinner w/ beef carving station, wine and dessert. They will have a short program with a couple presentations and 60s tunes from 8 to 9. Tickets are $35 per person, please RSVP by Tuesday, April 10 to higginsanet@gmail.com. 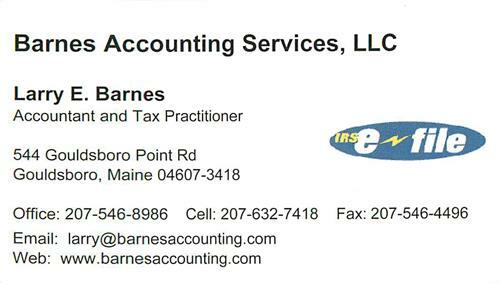 Program/Speaker: This week’s guest speaker was Delores Landry – Manager of Sarah’s House of Maine. In Delores’ previous career as a real estate agent she was responsible for the training and mentoring of new agents to Town & Country, REALTORS and it was there that she met Sarah. It was while Sarah was working with her that she was diagnosed with cancer. She quickly inspired everyone around her with her desire to create a hospitality house for patients of Cancer Care. Delores was committed, along with the rest of the team at Town & Country, to support Sarah’s dream. It became very clear to Delores, after spending time at the house getting it ready to open, that this is where her heart was leading her. She officially became the House Manager in December 2014 and feels truly blessed to be able to go to Sarah’s House every day and be a part of making Sarah’s dream a reality! Sarah’s House helps people get the cancer care they need, changes lives, and helps save lives. For many Mainers faced with a cancer diagnosis, life seems to stop.